The Turbo Happy Seeder allows farmers to sow a rotation crop directly into the residues of a previous crop—in this case, wheat seed into rice straw—without plowing, a practice that raises yields, saves costs and promotes healthier soil and cleaner air. EL BATAN, Mexico (November 28,2016) – Recent media reports show that the 19 million inhabitants of New Delhi are under siege from a noxious haze generated by traffic, industries, cooking fires and the burning of over 30 million tons of rice straw on farms in the neighboring states of Haryana and Punjab. 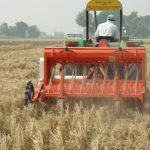 However, farmers who rotate wheat and rice crops in their fields and deploy a sustainable agricultural technique known as “zero tillage” can make a significant contribution to reducing smog in India’s capital, helping urban dwellers breathe more easily. 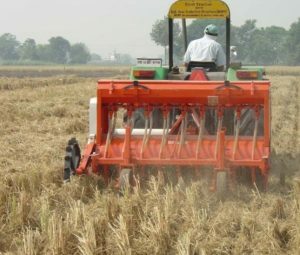 Since the 1990s, scientists at the International Maize and Wheat Improvement Center (CIMMYT) have been working with national partners and advanced research institutes in India to test and promote reduced tillage which allows rice-wheat farmers of South Asia to save money, better steward their soil and water resources, cut greenhouse gas emissions and stop the burning of crop residues. The key innovation involves sowing wheat seed directly into untilled soil and rice residues in a single tractor pass, a method known as zero tillage. Originally deemed foolish by many farmers and researchers, the practice or its adaptations slowly caught on and by 2008 were being used to sow wheat by farmers on some 1.8 million hectares in India. Click here to read more about how scientists and policymakers are promoting the technique as a key alternative for residue burning and to help clear Delhi’s deadly seasonal smog. In the 2014/15 cropping season, Ethiopia produced 4.23 million tons of wheat grain on 1.7 million hectares of land, with an increase of more than 2 million tons since 2007/8. Wheat is an incredibly important crop in Ethiopia and significantly contributes to the livelihood of smallholder farmers and urban consumers. EL BATAN, Mexico (August 24,2016)- High returns to global wheat research Building on more than a half-century of proven impacts, the global wheat improvement system led by CGIAR centers continues to be the chief source for wheat farmers in Africa, Asia and Latin America of critical traits such as high yields, disease resistance and enhanced nutrition and quality. 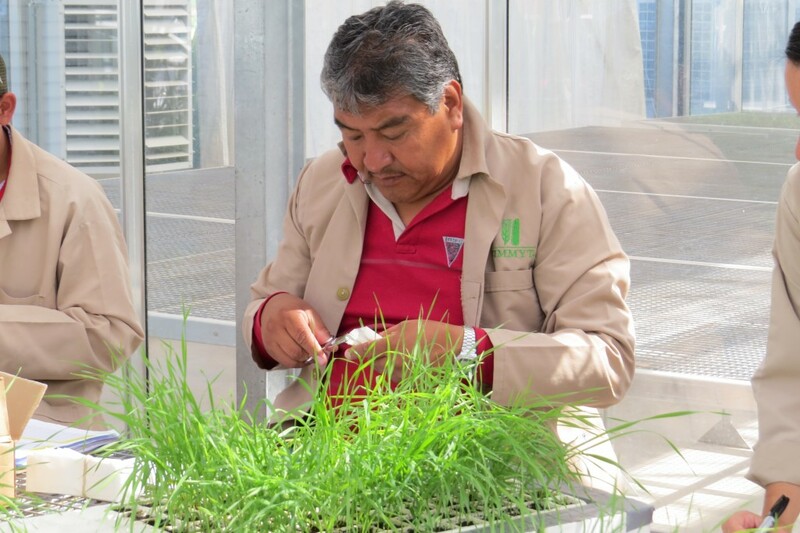 A recently-published study found that CGIAR-derived varieties – nearly all traceable to CIMMYT and ICARDA breeding programs – cover more than 100 million of 220 million hectares worldwide and bring economic benefits of as much as $3.1 billion each year. To achieve impacts in wheat agri-food systems, CIMMYT and ICARDA depend on national partnerships in over 100 countries and critical support from CGIAR Fund Donors and other contributors, whom we sincerely thank on behalf of the world’s wheat farmers and consumers. 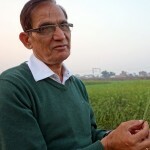 NEW DEHLI, India (April 22, 2016)-Ram Kanwar Malik, a senior agronomist in the Sustainable Intensification Program at the International Maize and Wheat Improvement Center (CIMMYT) based in Bihar, India, is the winner of the 2015 Derek Tribe Award for his outstanding contributions to making a food secure world by improving and sustaining the productivity of the rice-wheat system of the northwestern and eastern Indo-Gangetic Plains. 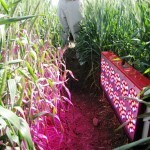 Fully 63 percent of the varieties featured CGIAR genetic contributions. This means they are either direct releases of breeding lines from CIMMYT and ICARDA or have a CGIAR line as a parent or more distant ancestor. 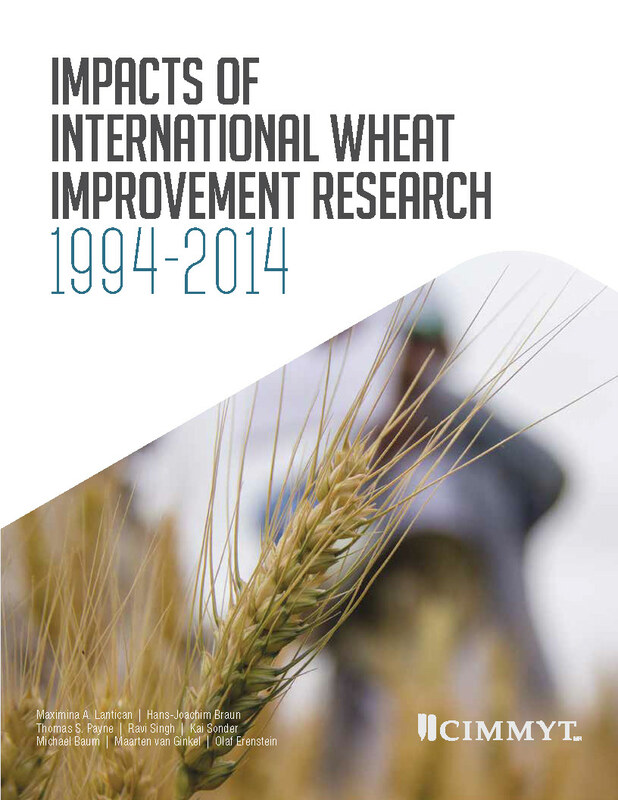 Yearly economic benefits of CGIAR wheat breeding research ranged from $2.2 to $3.1 billion (in 2010 dollars), and resulted from annual funding of just $30 million, representing a benefit-cost ratio of between 73:1 and 103:1, even by conservative estimates. 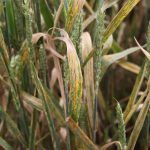 In South Asia, for example, which is home to more than 300 million undernourished people and whose inhabitants consume over 100 million tons of wheat a year, 92 percent of the varieties carried CGIAR ancestry. 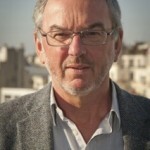 EL BATAN, Mexico (March 15, 2016)- John R. Porter of The University of Copenhagen, the Natural Resources Institute of the University of Greenwich, UK, and member of the WHEAT Independent Steering Committee, was granted Knight of the French Order of Agriculture Merit at a ceremony on 1 March. The Order of Agricultural Merit is awarded to those that have made extraordinary contributions to agriculture, via research or practice. The Order, which was established in July 1883 by the then French Ministry of Agriculture, is one of the most important recognitions awarded in France. 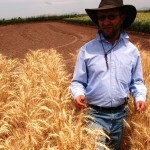 CIUDAD OBREGON, Mexico (March 11, 2016)- An agreement formalizing an international partnership to increase wheat yields by 50 percent by 2034 was signed 1 January 2016. 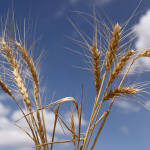 The agreement states that after years of planning and collaboration, the International Wheat Yield Partnership (IWYP) research will be hosted at The Norman E. Borlaug Experimental Station (CENEB) in Obregon, Mexico for an indefinite period of time. 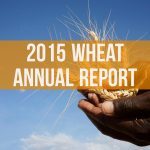 Originally announced at The Borlaug Summit in March 2014, IWYP will address issues concerning the widespread demand for wheat. 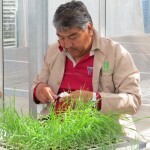 EL BATAN, Mexico(February 23, 2016)- With Syria torn apart by civil war, a team of scientists in Mexico and Morocco are rushing to save a vital sample of wheat’s ancient and massive genetic diversity, sealed in seed collections of an international research center formerly based in Aleppo, but forced to leave during 2012-13. 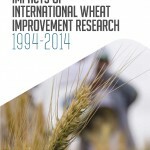 The researchers are restoring and genetically characterizing more than 30,000 unique seed collections of wheat from the Syrian genebank of the International Center for Agricultural Research in the Dry Areas (ICARDA), which has relocated its headquarters to Beirut, Lebanon, and backed up its 150,000 collections of barley, fava bean, lentil, and wheat seed with partners and in the Global Seed Vault at Svalbard, Norway. EL BATAN, Mexico (February 17, 2016)- Between 17th to 29th February 2016, the CGIAR Research Program on Wheat (WHEAT) is asking its research and development partners across the globe to provide feedback to the draft WHEAT Full Proposal for 2017-22. The Full Proposal is a research and funding plan that goes to the CGIAR Consortium and Fund Council on 31st March 2016. It includes feedback from previous partner consultations, notably the Global Partners Meeting (Istanbul, Dec 2014) and the Partner Priorities Survey (2013-14). WHEAT is very keen to get partners’ views on science content (the sections on Flagship Projects) and how WHEAT will partner in future (e.g. Partnership Strategy, sections 1.8 and 3.2). We are very grateful for your time and thoughts.